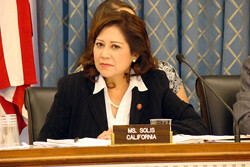 The Hill newspaper is reporting that Congresswoman Hilda Solis (D-CA) strongly is considering a bid for the Democratic Caucus Vice Chairmanship if the position becomes available with the departure of Congressman Xavier Becerra. The job will open up if he becomes U.S. Trade Representative. As reported in La Plaza, Becerra met with President-elect Obama last week to discuss the position. Solis was recently appointed to serve on the House Steering and Policy Committee but is apparently interested in climbing up the leadership ladder. While Becerra would become the second Hispanic to join the upper ranks of the Obama administration, Becerra is the only Hispanic member of the House Democratic leadership team. This would give Solis an opportunity to argue for her election as the best way to fill that void. Should Becerra leave Congress, the four-term lawmaker will make the “natural transition” pitch to the Caucus, according to aides familiar with her strategy.